Who would have thought five years ago, when we played our first ever League game against Torquay Utd, that one day we would find ourselves back in the Conference. Then, under the leadership of an enthusiastic Jan Molby, we believed that we could hold our own for the first few years and then go on to promotion maybe and a couple of good cup runs that would see us as an established force in the higher echelon. Sadly we didn't foresee the lack of ambition from a board room with their hearts still in non-league and the apathy from a population that would rather watch overpaid prima-donnas at Molinuex, Hawthorns and St Andrews or go shopping in Merry Hill of a Saturday. The loss and return, rightly or wrongly, of Jan was never answered properly by people that should have known better and the end result of the misguided idea of cutting costs to the bone backfired big time. Now we find ourselves back 'where we belong' according to some but this time round it's a tougher place to be. When were down this way last our main rivals in terms of stature were Hereford, Stevenage, Rushden and tomorrows opponents, Woking. Now we have a host of other ex League sides to contend with in Exeter, Halifax, York City and some clubs that have seen their star rising during our absence such as Aldershot, Grays and Crawley Town. Most of the Conference side are now also full time including the likes of Forest Green. There is also the cold fact that we cannot compete financially with the majority of Conference clubs anymore and us and Cambridge are going to find it tough going this season. It's going to be a season of consolidation for both of the relegated sides. The one point in our favour from our sojourn higher up is that we seem to have more in common with Cambridge, York and Exeter than we have now with Stevenage and Woking. On with the preview. This being the first real game for both teams means that for both sets of fans it's a day of getting used to new faces and giving them a bit of time to settle into a rhythm, it's up to us to be the first to gel and following on from some decent pre season friendlies we should have enough confidence to take the game to the Cards and end up as winners. Iyseden Christie seems to have gotten over his disastrous time last season and so far during the warm up he has knocked a few goals home for us and is tipped to be our leading scorer this time out with at least twenty goals. Also hoping to do better are Simon Russell and Wayne Hatswell. Scholesy will be looking to become a first team regular and not a bit player and Hats will be trying hard to get the boo boys off his back following what he admitted was a very bad season for him last campaign. The new boys will also be hoping to get a chance to shine and players like Michael Blackwood, Laurie Wilson, Taiwo Atieno and Gareth Sheldon will be out to make a name for themselves. Our rearguard should also look more solid this time round with the addition of experienced troopers such as Wayne Evans, Darryl Burgess and Martin O'Connor to the ranks. The only player that will be missing out on all this fun is young Chris McHale. He suffered a broken metatarsul bone in his foot during our first friendly at Bewdley and will be out until at least November. Woking will also be hoping for a good season this time and will feel that it's about time that they too got a crack at the Football League. The set-up down in Surrey is very professional and, apart from a soon to be rectified sub standard ground, they will be hoping to be in the play-offs at least come next May. Glenn Cockerill has assembled a fine side during his time there and is widely regarded as one of the more astute managers and could find himself being head hunted by some League clubs if his Woking side do well. They have just signed Mark Rawle, he played for us last season lest we forgot, but he pulled a hamstring last week and it's very doubtful that he'll be able to acknowledge the plaudits of the Aggborough clientele. Shame that!! One coincidence is that when we played that first time against Torquay their centre half was none other than Jimmy Aggrey. The tall, lean defender impressed me that day and I was somewhat surprised that he ended up at the Welsh side TNS Solutions for quite a long time until he was snapped up by Cockerill. I hope he's not that impressive this time out. 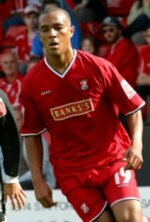 Woking had quite a few injuries in addition to Rawle with Ian Selley, Justin Richards, Shwan Jalal, Liam Cockerill and Jimmy Aggrey all fighting to make the cut but it now looks likely that just Liam Cockerill and Rawle will miss out. This game is the start of another new era for us and it's up to us, the fans, to get behind the lads one hundred and one percent. That includes getting behind Hatswell and Steve Burton but above all get behind Stuart Watkiss and the board. We have all got to work together to get us back where we belong. Danby, Lewis, Hatswell, Burgess, W Evans, Burton, M Jackson, O'Connor, Fleming, Graves, Hurren, Russell, Penn, Christie, Atieno, Hollis, Sheldon, Wilson, Blackwood, Thompson. Davies, Jalal, Ruby, MacDonald, S Jackson, El-Salahi, Aggrey, Smith, S Cockerill, L Cockerill, S Evans, Murray, Selley, Sharpling, Richards, Rawle, McAllister, Ferguson, Blackman.